I’m not typically one to jump on the ship of blaming the enemy. Mostly because I don’t want to give him the credit—I don’t want him to feel that important or to think that he’s affected me that much. But unfortunately, yesterday was not one of those times. He managed to deflate my excitement in a quick moment. The conversation went from elation to deflation in less than three seconds. It took all I had not to cry. And as soon as I got alone, that’s exactly what I did: cry. I hate those moments. I hate giving in to his deceit. And that’s what it is: deceit. (see Genesis 3:1- the serpent was the most [cunning, shrewdest, crafty, subtle, skilled in deceit]) He is a liar and a thief. (John 8:44; John 10:10) He seeks to destroy God by destroying us. Don't allow him the satisfaction. The enemy will attempt to deceive you, tempt you and accuse you. To help protect yourself from the enemy’s attacks, read more about the Armor of God to prepare yourself for the battle. (Ephesians 6:10-18). Gird your waist with truth: this means to have a true heart, unwavering resolve/allegiance [Side note: the belt was the last piece of armor attached by the Roman soldier—it symbolizes that having a pure heart for God will hold the rest of the armor together]. Put on the breastplate of righteousness: this means integrity, acting and thinking in purity to guard our heart. Shod your feet with the preparation of the gospel of peace: the Word of God is to be our footwear—it will keep you grounded and protect you—it will be your foundation. (Matthew 7:24-25). Take the shield of faith…to quench all the fiery darts: when we are drenched in faith, the shield will stop the devil’s fire from spreading when we get hit with a ‘dart’. [Soldiers would light the arrows on fire before firing them- Roman soldiers would douse their shields in flame retardant material to keep their shields (and themselves) from catching fire]. Take the helmet of salvation: keeping your mind focused on your promised eternity will remind you that you are not (and never will be) alone in this battle (Deuteronomy 31:6). And the sword of the Spirit, which is the Word of God: [the only offensive piece of the armor] that represents the individual passages (not Bible as a whole). The Bible is full of many different weapons, depending on the need: it is not one weapon, but an arsenal. Staying grounded in God’s Word will help you fight the deception. It will also help you grow in your walk with Him, which will help you overcome his traps of temptation. (Matthew 26:41, James 4:7) Having God’s Word written on our hearts and in our minds will help fend off the accusations (lies). His condemnation is futile when you have accepted Jesus. (2 Corinthians 5:17) The war is raging around us. 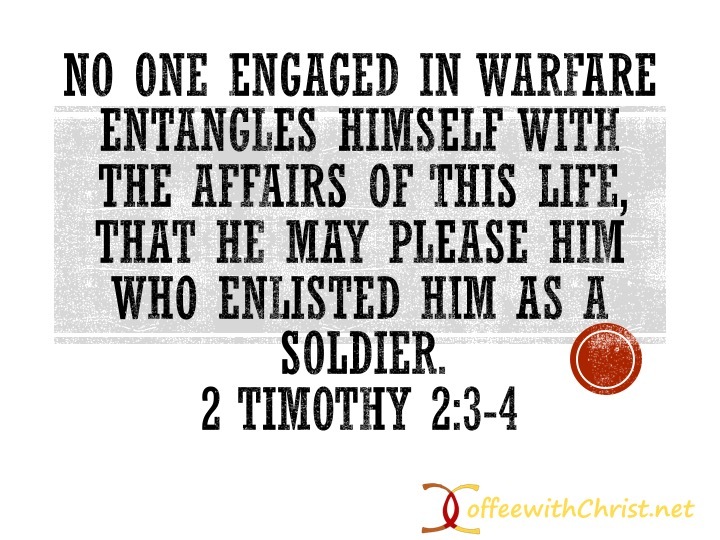 In order to gain victory with Jesus, we must engage and suit up in our armor. 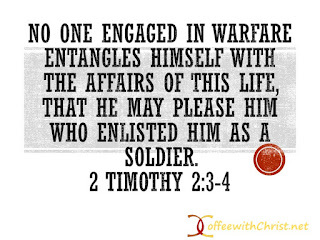 (2 Timothy 2:3-4).